Ever since the formation of the Third Polish Republic in 1989 I have wanted to visit Poland. Both sides of my family have ties there. My great-great grandfather Johann Weinert emigrated to Neustadt, Ontario in the mid-nineteenth century from Roßel (now Reszel) in East Prussia. His son Karl, my great-grandfather, moved to Detroit and my family has been in the Metro area ever since. Johann moved to Canada at a time when the nation of Poland as we know it did not exist. Although he clearly was of German descent and was German-speaking, we have numerous family correspondences written in Polish. My grandmother’s maiden name was Czyniewski and she grew up in Hamtramck. Unfortunately, I don’t know where her family came from in Poland or when they came to the US. 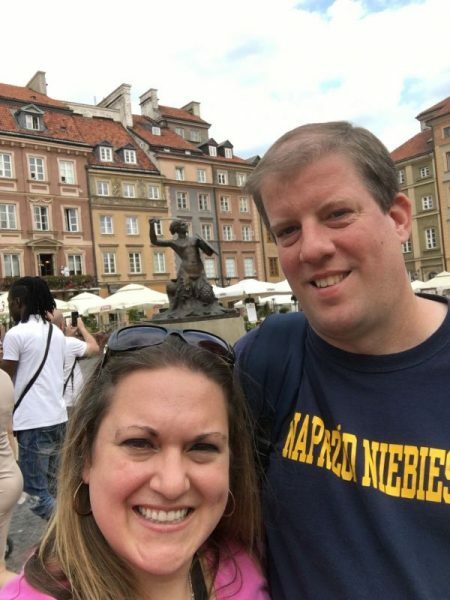 So, when the opportunity came to visit Poland this past September after a conference I was attending in the Czech Republic, my wife Christa and I decided to take the opportunity to spend a week there, with stops in Warszawa and Kraków. I had long imagined what these places would be like, both culturally and physically, and was delighted to finally find out. We boarded a train in Pardubice, Czech Republic, and made the six-hour trek to Warszawa. We crossed over into Poland into the small town of Chałupki, Lower Silesia and continued through Katowice and then through the countryside to Warszawa. The countryside consisted primarily of plains with some rolling hills in the distance. It was lush, green, and there were fruit trees growing everywhere. We passed through many small towns with charming houses and cottages. When we arrived in Warszawa, we made our way from the train station to the Polonia Palace Hotel where we stayed, which was directly across the street from the Pałac Kultury i Nauki (Palace of Culture and Science). This beautiful building is one of the tallest in Europe and is reminiscent of the Empire State Building in New York. One can take an elevator to the observation deck on the 30th or so floor, which we did, and there were spectacular views of the entire city. At night, the building is illuminated with multicolored lights that is also renders it stunning to behold. Unfortunately, many Poles understandably do not see this building in the same light as it was constructed in the 1950s under communist rule and there are calls to demolish the building as a result. Our first evening in Warszawa we also took a stroll through the downtown area through the shopping district, where there are still small family-owned grocery stores right next to large international department stores, to the Saxon Garden Park. As we passed through the park we came upon a military formation of the Polish army at the Grób Nieznanego Zołnierza (Tomb of the Unknown Soldier). We stopped to observe what was occurring and a motorcade soon arrived carrying a person of some apparent importance that turned out to be Boris Johnson, former Mayor of London and British MP. During a short ceremony he placed a wreath on the tomb, and a local man told me that this was an apologetic action for the recent violence in the UK directed at Poles in the wake of Brexit. This was an interesting and unexpected part of our visit. On our second day we explored Stare Miasto (Old Town), which of course isn’t really all that old. It is an amazing sight to see since it was meticulously reconstructed from the ruins after World War II. If one did not know any better, it would appear that all the buildings, streets, and everything else were from the 18th and 19th centuries or before. We came upon a plethora of small shops selling amber jewelry, which we discovered was mined locally in the area and also elsewhere in Poland. There were a significant number of beautiful Catholic churches in Stare Miasto as well. Many are located across the street or just down the block from each other and each one had beautiful architecture, icons, and altarpieces that were unlike anything one commonly sees in Churches in North America. The next day we visited the Museum of the Warsaw Uprising and this was a very moving experience. One can read about the events that transpired in August – October 1944 or see documentaries on television, but it is a much different to be in the place where these events happened, hear first-hand accounts of the events, and see weapons, uniforms, tools, and other items that were actually used in the conflict itself. There are accounts, both written, photographic, and in video form, of everything from the preparation and beginning of the uprising to its brutal ending. The accounts of what the Nazis did to the people of Warszawa were very difficult to take in. There is a 3D video of the remains of the city after the Nazis destroyed it that was also very disquieting. There was absolutely nothing left in late 1944, and to walk out of the museum and see the rebuilt vibrant Warszawa was an incredible contrast. We also visited the POLIN Museum of the History of Polish Jews. The POLIN museum was very interesting in that it details a 1000 year history of the intertwining of Jewish and Polish history. There is not a story like this, in my opinion, anywhere else in the world. Both cultures lived side-by-side for centuries and often reinforced and contributed to each other. There was also a moving history of the holocaust but this museum was much more than that. It is so extensive that one could easily spend a whole day or more there. After three days in Warsaw we left for Kraków and spent a lot of our time there exploring old town, the market square, and Wawel Hill. Atop Wawel hill sits an entire complex that encompasses a very important part of Polish history. This includes Wawel Cathedral, Wawel Palace, the Cathedral Museum, and the ruins of several early Churches and other structures. The architecture of the Cathedral is interesting because the main structure had numerous chapels and other features added to it over the years such that a lot of the architecture is not consistent. Inside the cathedral are the tombs of many important figures from Polish history, including Jan III Sobieski, Casimir III The Great, Władysław II Jagiełło, and Saints Stanislaus and Hedwig. The Cathedral Museum is also known as the Saint Pope John Paul II museum, where the pontiff’s clothing and relics are displayed. It was astonishing to see items he actually wore and used during his time as Pope and the whole experience in Kraków reminded us that we were in the place where he once served as Archbishop before becoming Pope. Down the hill from Wawel sits Krawów’s main market square that was a very vibrant place and was remarkable due to its sheer size, especially compared to other central city squares across Poland and Europe. We visited St. Mary’s Basilica that is located in the square. The wooden altarpiece in this Basilica is extremely large and reaches almost to the vaulted ceiling. It details the major events in the life of the Blessed Virgin Mary and the amount of detail is astounding. Every hour the Hejnał Mariacki is played from the taller of the two towers of the Basilica, which is cut off midway through to commemorate the trumpeter that took an arrow to the throat during the Mongol invasion of Kraków in the 13th century. We could actually hear this from the apartment where we stayed if the windows were open. We also visited the famous Sukiennice (Cloth Hall), which has booths with many vendors selling souvenirs, clothing, pottery, wood carvings, and many other items on the first level. We visited the Jewish section of Kazimierz and toured both the Old Synagogue, which was looted by the Nazis in World War II but was not destroyed, and the Remah Synagogue and Old Jewish Cemetery. The Nazis destroyed the cemetery and stole the majority of the tombstones that were then used as paving stones in the concentration camps. Several of these have been returned and the cemetery was and is undergoing restoration. We also visited the Galicia Jewish Museum that details the holocaust and the remnants of Jewish life in Poland afterwards primarily through still photographs. All of these places were a stark reminder of the horrors of the Holocaust and the will of the Jewish people to carry on despite intense persecution. One thing we enjoyed very much in both Warszawa and Kraków was the cuisine. We sampled cuisine in the Stare Misato areas of both cities, such as Pod Herbami in Warszawa, and these were excellent. They are, however, geared toward tourists and there are many very good and more authentic Polish restaurants a little bit farther out from the Old Town areas. There is also a variety of cuisine to sample from elsewhere in Europe, including places that are uncommon in the US. For example, we found a very good Georgian restaurant called Mała Gruzja a block from our hotel in Warszawa. There were several Georgian restaurants in both cities we visited, but these are quite rare in the US. My Polish-American grandmother often cooked the staples like pierogi, kiełbasa, gołąbki, etc. and I have eaten many Polish restaurants in the Metro Detroit area over the years. However, we found that Polish food was significantly different that that one finds in the US, even though the dishes have the same names. The dough used to make pierogi was much lighter that what I am used to, and the żurek (sour rye soup) served in Poland was much more rich than what one finds in restaurants here in the US. We also tried rolmopsy (rolled pickled herring) and steak tartare for the first time, the latter of which I liked a lot. Nearly every place we ate had Żywiec, which is my favorite beer, or Okocim on draft and these also taste a lot different than they do in the US. We also discovered the wonders of Żubrówka (Polish bison grass vodka), as well as the proper etiquette of drinking it-do dna (to the bottom). No sipping! After three days in Kraków it was (sadly!) time to return home. One of the most enduring memories I have of the trip was the friendly and welcoming nature of the Polish people. I had heard stories that Polish people don’t make eye contact on the street and don’t smile that often, which leads some Americans, particularly those where I live in Oklahoma where these actions are very common, to think that the Polish people are unfriendly. We found everyone to be very welcoming and friendly, and helpful in directing us on the right path to places we wanted to visit or figuring out which coins/bills to use when making a purchase. One thing that did stand out is that exact change is always appreciated, so it would have been useful to learn which currency was which before visiting. Our Polish is not very good (despite a significant effort to learn the language through Rosetta Stone and other methods), but knowing how to say simple things such as dzień dobry (hello/good day), proszę (please), dziękuję (thank you), do widzenia (goodbye) can get one a long way. Many people in Poland, at least in the large cities we visited, do speak English but certainly appreciate it if one learns at least the most rudimentary parts of their language. Knowing a few more phrases, even with bad pronunciation, also was very helpful. Needless to say, we explored only a small part of Poland and there are a lot more places we would like to visit. Next time, we plan to maybe visit Gdansk, Poznan, Łódź and hopefully Reszel. The time to return can’t come soon enough! Scott Weinert is a native Detroiter and grew up in the McNichols/Mound area, East Detroit (now Eastpointe), and Berkley. He graduated from the University of Detroit Jesuit High School in 1990, obtained a BS in Chemistry from the University of Michigan-Ann Arbor in 1995, a MS in Chemistry from the University of Chicago in 1997, and a PhD in Chemistry from Northwestern University in 2000. He was a Postdoctoral Research Fellow at Purdue University from 2001 – 2004 and became an Assistant Professor of Chemistry at Oklahoma State University in 2004 where he is now a Full Professor. He’s married to Christa Feasley (2004), who he met at Purdue and is also a PhD Chemist working for Thermo Fisher Scientific, and they have a ten-year old son Charles James (CJ) and live in Edmond, Oklahoma with their cat Zygmund Kasimierz (code name: Kitty). Dr. Weinert is Polish history enthusiast and aspires to learn the Polish language well sometime-in his professional opinion, he needs some courses at Orchard Lake ASAP!